Who It’s For: Your mystical magical gal pal, to roll out at her next party. Your cheese-obsessed big sister, as a fun spin on a must-have kitchen accessory. Your weekend cabin adventure host, along with a few packages of fresh, unique cheeses. A last-minute opportunity to earn a bonus entry into my Last Minute Gifts post is in store for any of you lot that leave a comment on this post: tell me what you think of this ‘cheesy’ gift idea? this would be fun for a Halloween party! Very nice novelty item for special appetizer situations. I think it is a great idea for those hard to buy for people. I think it’s fun and a great conversation starter. I think it’s a neat idea, but I’m not the biggest fan of how it looks, to be honest. I love it; conversation starter, useful and a bit of fun! Great idea — it would be fun if they did more retro game boards! 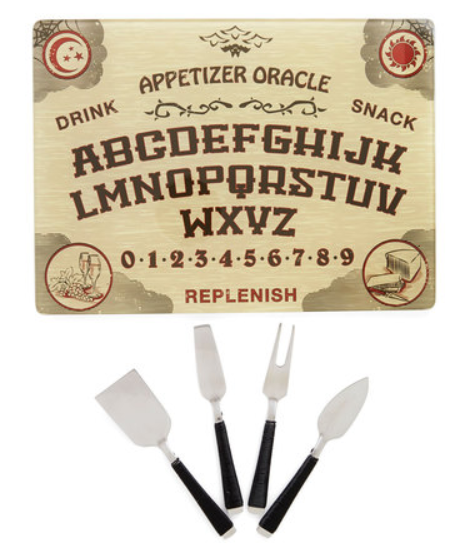 What a cute idea – perfect for my sister as she loved her ouija board when she was a tween. I love it, it would be the perfect gift for my soon to be sister in law! This would be really fun for a party! I think it’s fun, great for a soiree. my best friend would love this, she’s into cheesy things. I’m afraid of ouija boards so this freaks me out a bit!! I really love the Ouija board design! Perfect for Halloween. I don’t think I’d like it myself, but I’m sure a few people would be pleased to receive this as a gift.